The eighth film to feature the monster King Kong is a mess of tones and idiotic character motivations but the titular character has lost none of his appeal and that along with some bright sparks of imagination maybe enough to hold audience interest throughout. The year is 1973 and American involvement in the Vietnam War is coming to an end. Bill Randa (John Goodman) and Houston Brooks (Corey Hawkins), agents of government organization Monarch obtain funding to lead an expedition to a newly discovered island in the South Pacific shaped like a skull. They recruit an attack helicopter squadron from the U.S. Army, war photographer Mason Weaver (Brie Larson), geologists, and for a tracker/hunter James Conrad (Tom Hiddleston) a former Captain in the British Special Air Service. Tooled up with bombs for seismic recording and ammunition galore they plan to fly in, do tests and observe before flying out three days later on the other side of the island. With the island covered in storm clouds fizzling with red lightning they take off in their open door gunships to see what they can find paradoxically armed to the teeth for what should be map drawing and yet completely unprepared for what they do find. What they find is a 100 foot tall bipedal ape who quickly takes them apart after their bomb dropping seemingly awakes the beast in him. Considering these helicopters are more than capable of flying to altitudes well over 10,000 feet it seems a special kind of stupid when these war veterans fail to change tactics in the face of overwhelming force but it ain’t every day you get set upon by a giant monkey. Besides such escapes would not only derail the plot but the set pieces which are the better parts of the film. The monsters and monsters fights never cease to be entertaining and inventive whereas the human characters often are either incredibly stupid or incredibly bland. Given the cast assembled that is a special achievement in itself. Plenty of these actors you’ve seen do better work in other films, disappointingly Samuel L. Jackson’s Ahab like Lt Col. Preston Packard fails to convince as a leader who wants a winnable war and is prepared to risk losing more men in a personal vendetta against Kong following the initial onslaught. 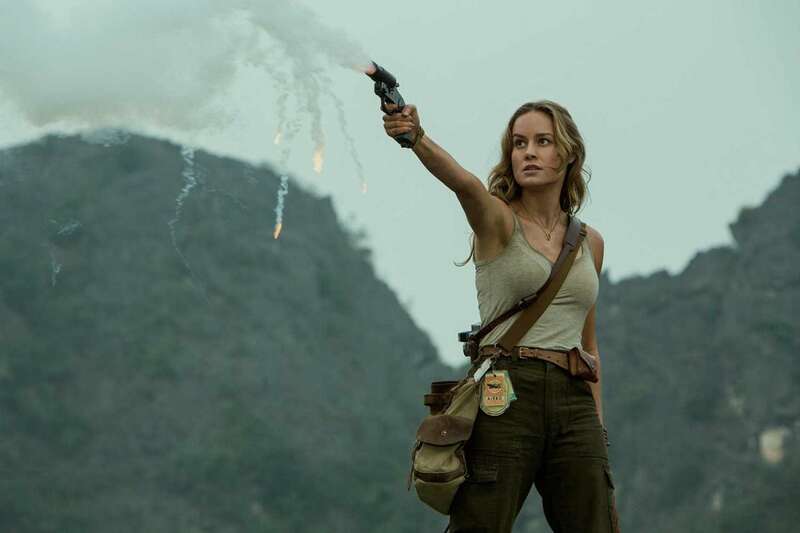 Brie Larson fills out a tank top well but besides being one of the more sensible human characters never makes much of an impact. Tom Hiddleston fills out a tight T-shirt well but fares even worse. Two performances manage to stand out, one is Shea Whigham as one of Packard’s men Captain Earl Cole who takes everything in his stride like the pragmatic war weary soldier that he is because what else can he do. 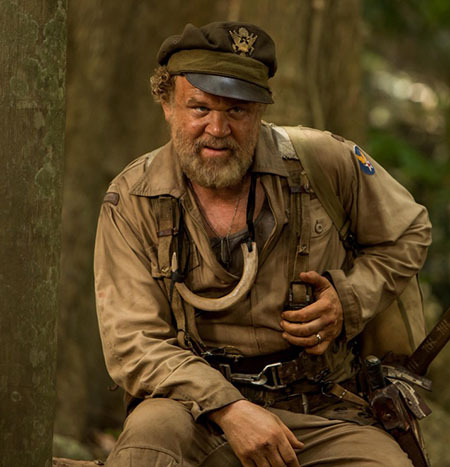 John C. Reilly is the second in a role that should be thankless but becomes the most memorable. Playing a downed World War II pilot named Hank Marlow (geddit) who crashed on the island twenty eight years earlier he is part exposition and part comic relief but conveys the heartache of these years lost to the world. The filmmakers seemed to recognise the impact Reilly’s performance has and give him a credits sequence that satisfies in a very simple way and maybe nails the subtext that often eludes them. A good example of missed character opportunities is Hiddleston’s Captain Conrad (geddit) mentions a father who went missing in World War II but never takes an interest in a man of that generation who went missing from his family too during that same war. The pacing is good, the first act rushing to get to the island where the action is but taking the time to establish the different characters. The film slows down in between major action scenes too to help us get to know the human characters more but for the most part the dialogue isn’t there and the decisions made by these people cannot enamour us to them. 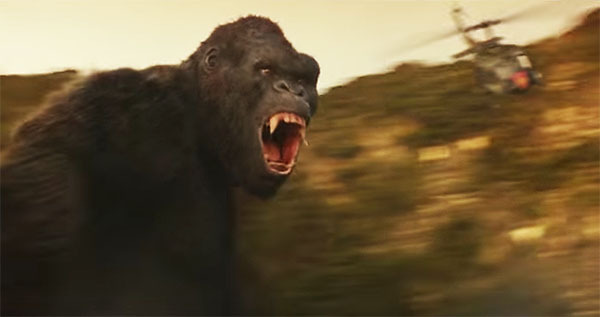 “Kong: Skull Island” suffers from the same fate as stable mate “Godzilla”, they got the monsters right but the humans fail to hold interest for the most part. In place of the 1933 original’s “Beauty and the Beast” subtext there’s analogies about man’s thirst for war and the environment protecting the ecosystem. For all the fetishizing of 1970s technology and call-backs to “Apocalypse Now” though the best bits are striking new images whether it be Kong slurping squid tentacles like noodles, a Nixon bobble head on the dash of a crashing Huey or a soldier placing a carbine on a prehistoric skull. A bit more of the creative genius that went into these neat images being directed towards the screenplay might have elevated this into a classic. As it is, fans of monster films should find enough here to enjoy and celebrate, for the rest of us the blockbuster season has just begun and there surely must be better films to come.